Public Impact’s research-based recommendations align with the [NC Pathways to Grade-Level Reading initiative‘s] Design Team’s draft Action Framework, which will be shared publicly in late October. The Framework outlines expectations for NC’s child and family systems, and recommends actions the state and other actors can take to improve outcomes in three areas that impact third grade reading proficiency – children’s social-emotional health, high quality birth-through-age-eight care and education, and regular school attendance. 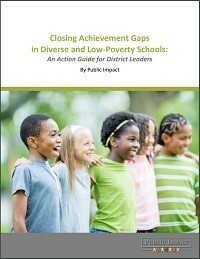 The Action Framework uses a racial equity lens, and proposes that equity and learning from and engaging families are critical twin pillars for a successful approach. The Framework also stresses that children live in the context of their families and communities, and meeting family needs is essential for children’s success. Read Ableidinger’s full column here, and tweet us (@PublicImpact) with your thoughts!